Energy savings, high reliability and manageability. These were Zanotti Spa's objectives, a company specialized in the manufacturing of cooling and air conditioning systems for the entire cold chain. For the food industry, Zanotti has developed a highly innovative cold storage system. A system to preserve apples and implemented in the region of Kabardino Balkaria, Russia. Zanotti Spa was chosen as the supplier of "turnkey" cooling systems with a controlled environment, refrigerator doors and accessories for this modern system conceived to preserve around 13,000 tons of apples. 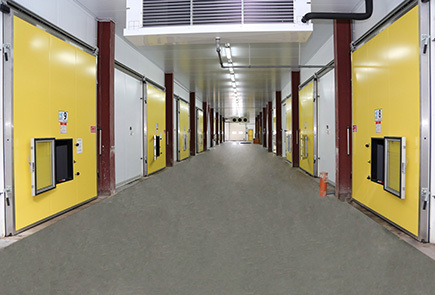 Zanotti Spa was chosen as one of the best worldwide manufacturers of this type of storage system, thus overtaking the strong Dutch and German competitors. It's an R404A (primary coolant) and a FORM 30 (non-toxic and non-freezing solution with an elevated thermo-physical performance) installation with a sophisticated control and management system. The results have met the high quality expectations for stored products and confirmed the reliability and low energy consumptions. The BESTCOP optimization system, conceived to provide the best performance, especially under difficult environmental conditions, has been installed. 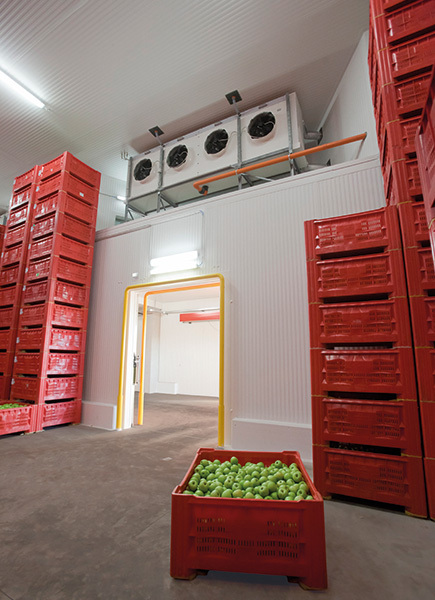 48 storage cells with a minimum internal temperature of 0°/-1° C, a volume of about 1,100 cubic meters and the possibility to store 270 tons of apples. The primary objective was to achieve a system that ensured the utmost quality of stored products with the lowest weight loss and a high coefficient of performance with low energy consumption and maximum safety. A highly efficient system in terms of performance and heat exchange was designed. The cooling capacity of the system is of about 1,500 kW. 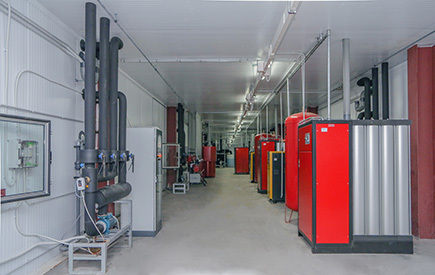 The cooling station is composed of units equipped with screw compressors and an automatic management system to optimize performance, thus only allowing the system to work under the most convenient conditions. Special attention was focused on the need to reduce as much as possible the defrosting by maintaining the lowest difference possible between the air temperature and the coolant. This also makes it possible to achieve the least amount of air dehumidification possible, which is always kept at levels above 90%, even in the absence of additional humidification. Humidification systems for the preservation of summer fruits were anyhow installed for the summer season without apples. The installation is complete with a computerized system to monitor the temperature, humidity, oxygen and CO2 levels and all the most significant parameters of the system. Like all Zanotti systems, this one is also connected via Internet to the Italian headquarters for real time monitoring. This storage system is the direct result of the customer's visit to the recent cooling storage of Agrintesa in Bagnacavallo, which was implemented by Zanotti Spa. 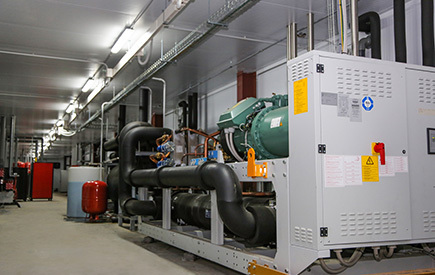 This system, equipped with 54 cooling cells and the same Controlled Environment technology, was carefully evaluated by the Russian customers, who thus chose Zanotti to implement their new structure.